My daughter's birthday is today, just slightly more than a week before Halloween. The timing opens up some fun possibilities for party themes. And indeed she chose to go with a Halloween theme this year, asking her friends to come to her party in costume. We held the party on a Friday evening and I pretty much spent the entire day shopping and decorating. The kids and their dad helped out after school too. Here's the birthday girl adding washi tape flags to party straws, above. 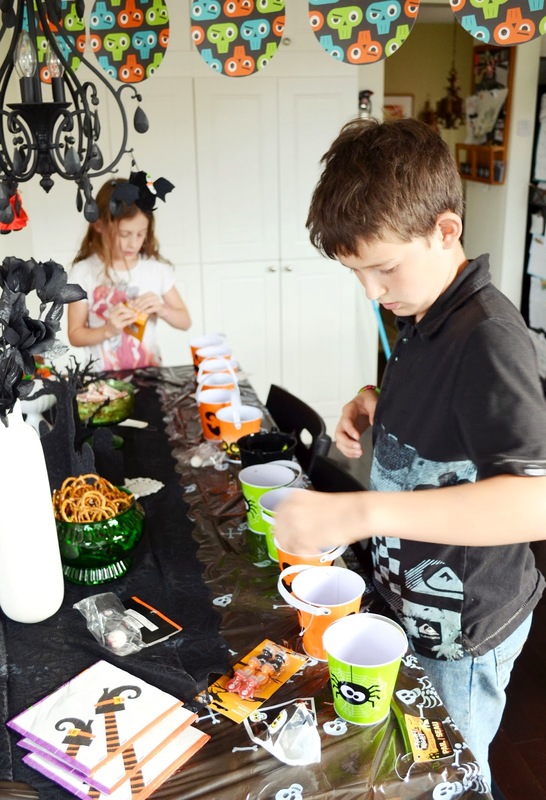 The kids prepared the loot bags (or, in this case, loot buckets) assembly-line style. 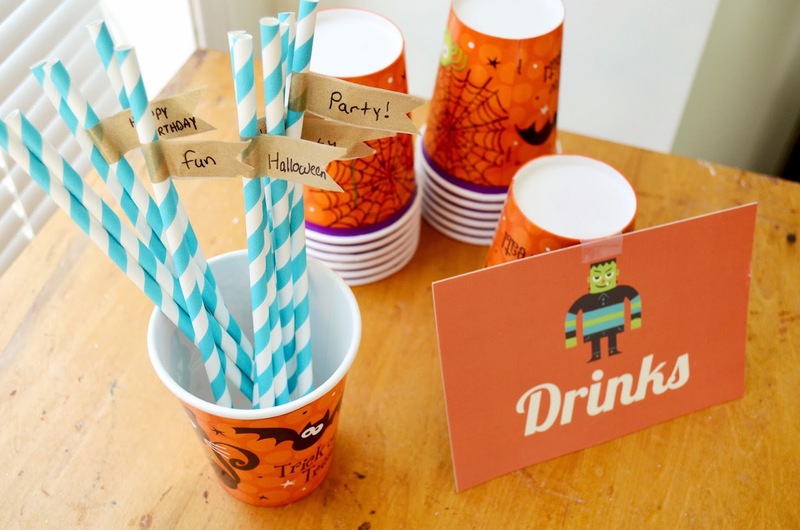 I ordered the birthday banner, "drinks" and "treats" cards, straws and washi tape from Minted. 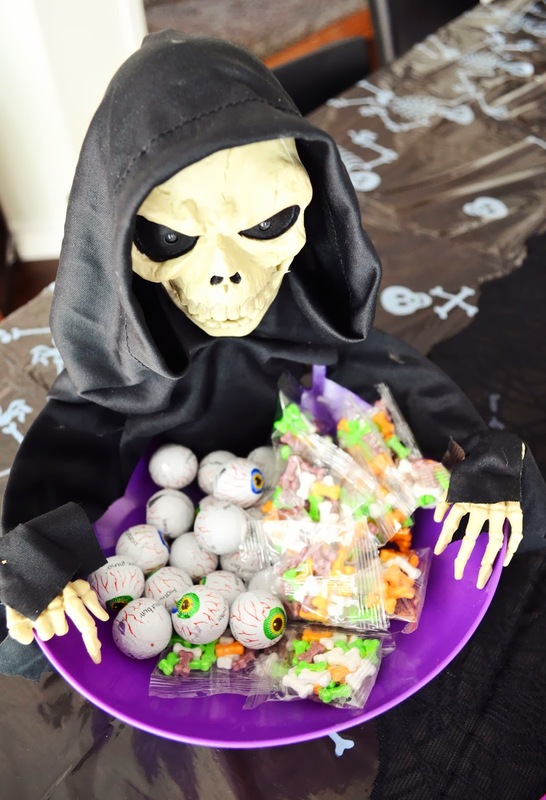 A Halloween theme calls for candy, of course. I also put out some healthier snacks, like this fruit platter with banana chocolate chip ghosts and mandarin celery pumpkins. The girls loved these. I found the idea here. 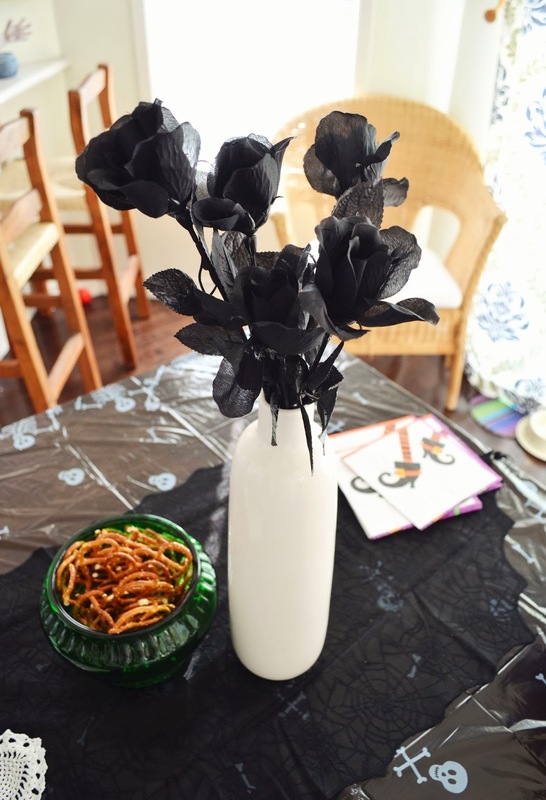 I bought all kinds of Halloween decorations at 90% off after Halloween last year, so we had lots to decorate the house with. 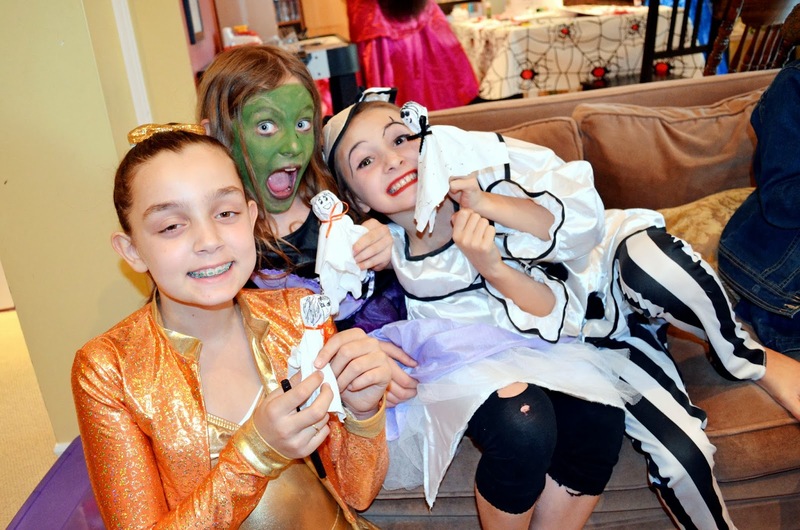 It was a lot of fun to see these cute 8- and 9-year-old girls (and one brave boy) dressed up and ready to party. 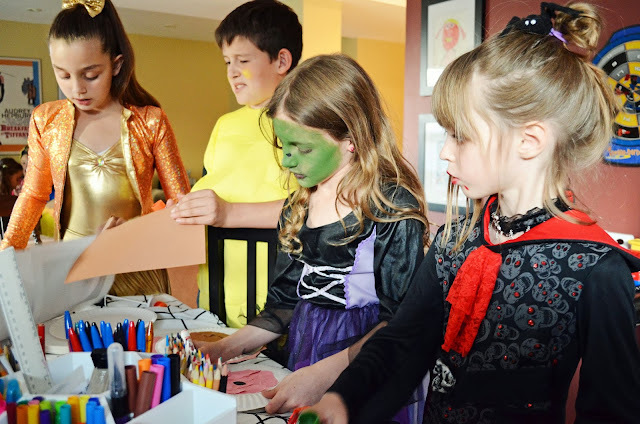 We started off with some Halloween crafts. The kids made easy bloodshot eyeballs from paper plates. See the inspiration here. A small note if you buy your construction paper at the dollar store like I did - although they showed lots of colours on the exterior packaging, there were only a few colours inside. Hence, the brown and pink eyes. They also made lollipop ghosts. I cut up an old white sheet into squares. 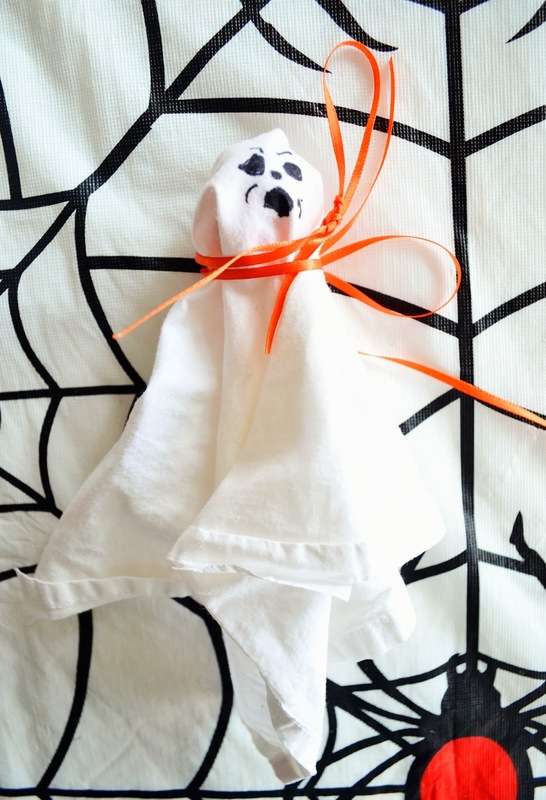 Then all you have to do is wrap a piece of the cloth around a Tootsie Pop, tie off the "neck" with an orange or black ribbon and draw on a face with a permanent marker. Simple and fun! Except the girls kept asking me when they could eat the lollipops. I recommended at least taking them home to show their parents first. My girl opted for ghost-shaped cupcakes instead of cake. We overfilled the cupcake pans a bit, so they overflowed and didn't look much like ghosts. But the kids didn't seem to care. They piled on icing, gummy worms and candy topping and went to town on them. You go all out!! Fantastic photos and such fun decorations and refreshments. 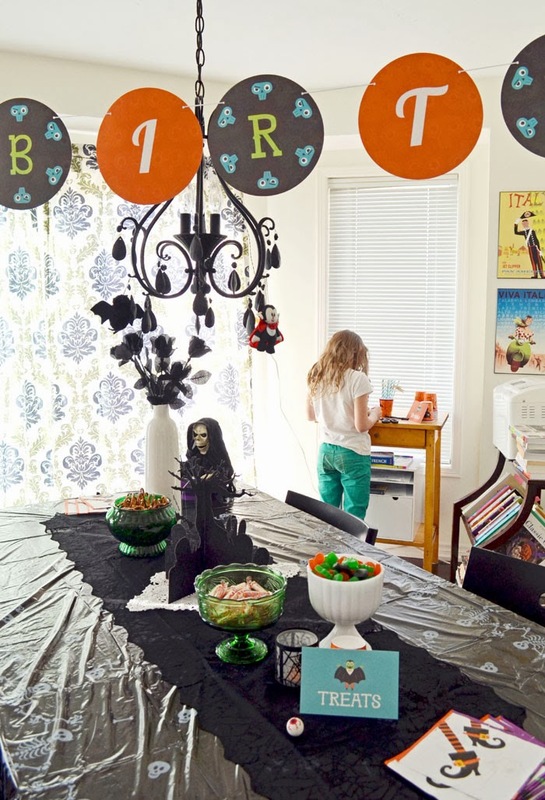 I really love this...a far cry from the birthday parties my sister had on Oct 26 back in the 50's when we played pin the stem on the pumpkin year after year! Love the decorations, so festive and fun! Wow I really love the decor! Great job! 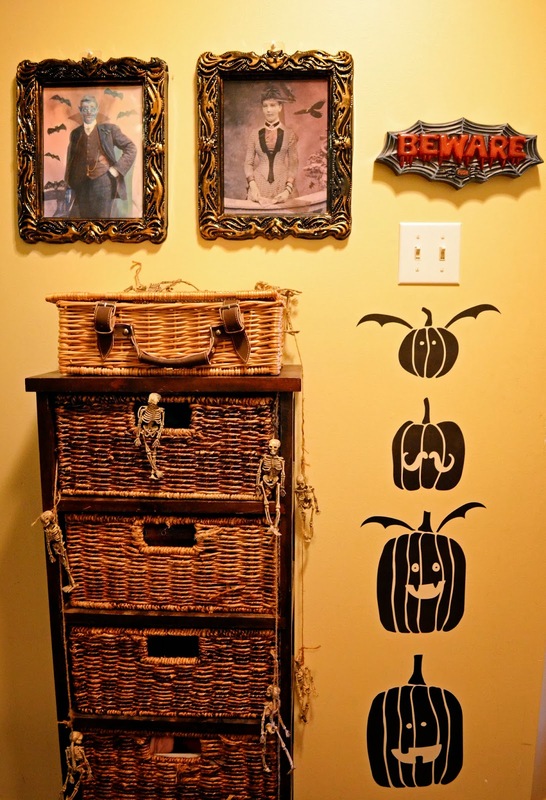 Great job with the decorations Joann, and so thrifty buying them after last Halloween. The birthday girl said she chose the Thai food restaurant for her birthday meal. Good choice. Enjoy! This looks super fun. 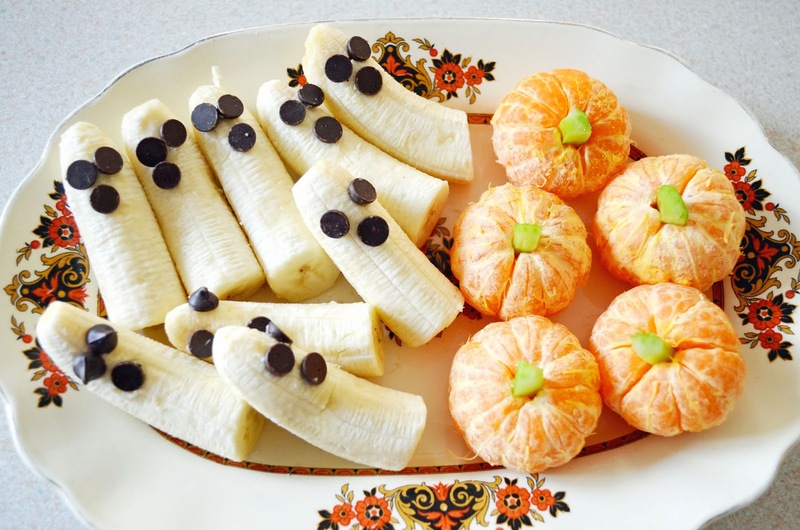 I love the idea of dressing the oranges up as pumpkins. Neat! So cute! 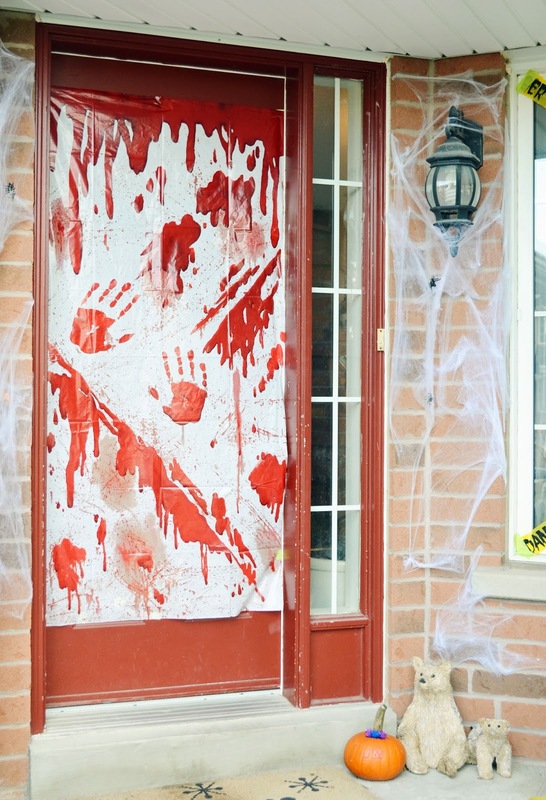 The decorations looked great! Thanks so much! I totally wouldn't think of these ideas on my own either. You are so creative!! Bet the girls thought it was a great party! Thank you Jill. You are sweet. I hope they liked it! What a fantastic party!! 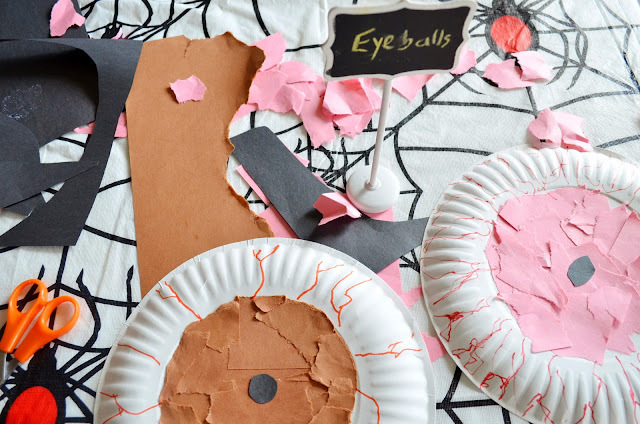 Love the crafts & goodies-- such cute ideas, as always! What a great way of making is special for your daughter. 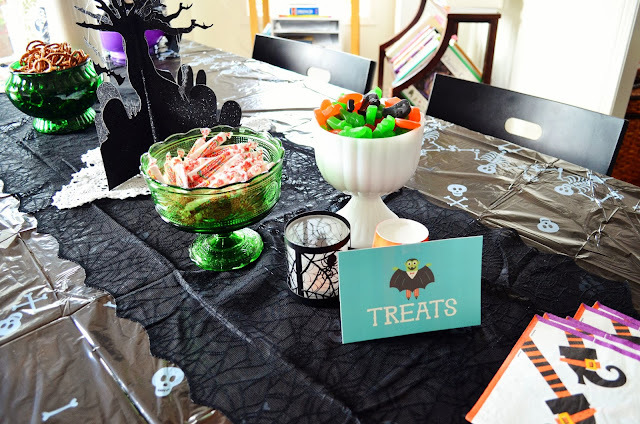 My husbands birthday was yesterday so I don't put up any Halloween stuff until we get through that so we can concentrate on his birthday... but your idea is WAY better! Thanks for sharing. Thanks Margarita! I let her decide and she wanted to make it about Halloween. Convenient for us. But I imagine that it would be harder to sell that idea to a grown man. ;) Happy B-day to your husband btw! I love it! You did an amazing job decorating :) Happy birthday to your gal! 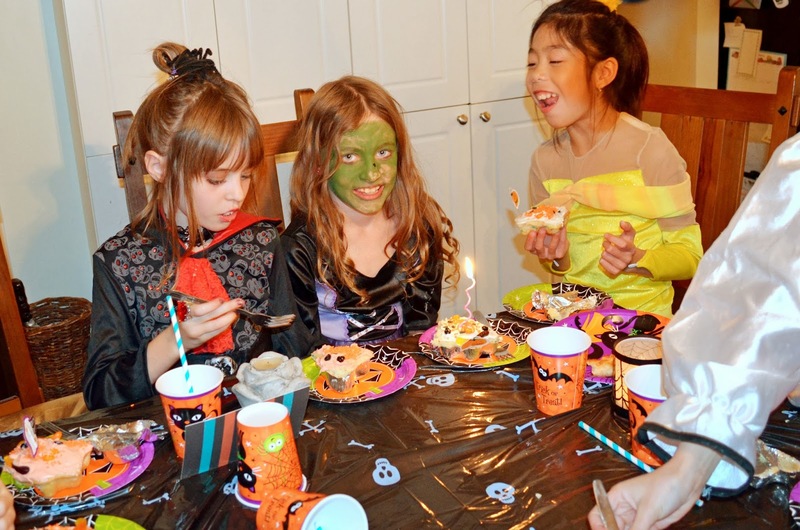 looks like a fun halloween party! So memorable! Way to go, mama! How fun! You guys went all out, and I'm sure it was a fantastic day for your girl! Happy birthday to her! Happy Birthday to your beautiful girl, Jo!!! Please come decorate for my party! :) This couldn't be more perfect!